Do you have a hard time peeling boiled eggs? Y'know, you get started and the egg is too hot, the shell won't peel off, and you end up digging with your fingers only to lose a lot of the actual egg in the process? Well, not anymore! We'll show you how to peel a boiled egg the easy way, so you're left with just as much egg as you started with. Then, you can make all the yummy deviled eggs, egg salads, and other egg recipes you love! 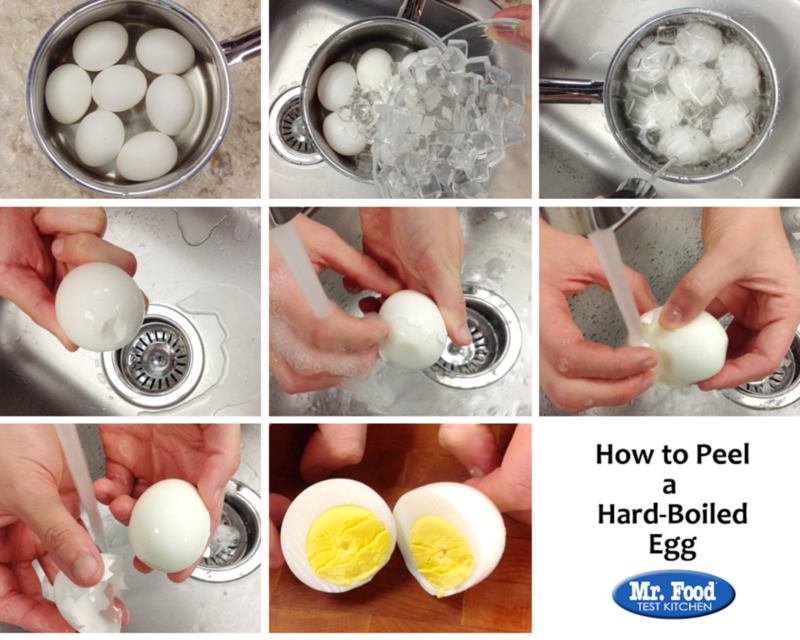 Check out our video and tips on how to peel a boiled egg . Once you see how easy it is, you'll never struggle with egg shell pieces again! After you've boiled your eggs, drain the pot, run it under cold water and then add ice to it. Adding ice shocks the egg, making it easier to peel the shell off. Take your egg and tap each end gently enough so that the ends crack. You can do this with a spoon, or against the counter/sink. Once you've tapped both ends of the egg, roll it a few times on the countertop. Then, peel from the larger end, making sure to get under the thin membrane. The shell should come off easily! Click here for some tasty ideas for what to do with your hard-boiled eggs! Thanks for the tip on peeling a hard boiled egg. I will give it a try. I would love to be able to make deviled eggs but I have no luck at all peeling hard boiled eggs. I follow the directions and peel them under cold water but I have to make 3 dozen hard boiled eggs in order to get one dozen that are presentable to take anywhere. The whites are always all torn up. And I'm stuck with eating egg salad for a week.